ADHD, also known as hyperkinetic disorder (HKD) outside of the United States, is estimated to affect 3%-9% of children, and afflicts boys more often than girls. Although difficult to assess in infancy and toddlerhood, signs of ADHD may begin to appear as early as age two or three, but the symptom picture changes as adolescence approaches. Many symptoms, particularly hyperactivity, diminish in early adulthood, but impulsivity and problems focusing attention remain with up to 50% of individuals with ADHD throughout their adult life. Children with ADHD have short attention spans, becoming easily bored and/or frustrated with tasks. Although they may be quite intelligent, their lack of focus frequently results in poor grades and difficulties in school. Children with ADHD act impulsively, taking action first and thinking later. They are constantly moving, running, climbing, squirming, and fidgeting, but often have trouble with gross and fine motor skills and, as a result, may be physically clumsy and awkward. In social settings, they are sometimes shunned due to their impulsive and intrusive behavior. The causes of ADHD are not known. However, it appears that heredity plays a major role in the development of ADHD. Children with an ADHD parent or sibling are more likely to develop the disorder themselves. Before birth, ADHD children may have been exposed to poor maternal nutrition, viral infections, or maternal substance abuse. In early childhood, exposure to lead or other toxins can cause ADHD-like symptoms. Traumatic brain injury or neurological disorders may also trigger ADHD symptoms. Although the exact cause of ADHD is not known, an imbalance of certain neurotransmitters (the chemicals in the brain that transmit messages between nerve cells) is believed to be the mechanism behind ADHD symptoms. Further criteria to establish a diagnosis also require that some symptoms develop before age seven, and that they significantly impair functioning in two or more settings (home and school, for example) for a period of at least six months. Many individuals with ADHD have symptoms from all three of the above categories. Some children, however, have behavior patterns in which inattention dominates, or hyperactivity and impulsivity dominate. For this reason, ADHD can be further categorized, or subdivided, into three subtypes. Children who have at least six symptoms from both of the inattention and hyperactivity-impulsivity categories above may be diagnosed with ADHD, combined type. Children who meet the symptom criteria for inattention, but not for hyperactivity/impulsivity are diagnosed with attention-deficit/hyperactivity disorder, predominantly inattentive type, commonly called ADD. Children who experience more symptoms from the hyperactivity and impulsivity categories, but fewer than six symptoms of inattention may be diagnosed with ADHD, predominantly hyperactive-impulsive type. The first step in determining if a child has ADHD is to consult with a pediatrician. The pediatrician can make an initial evaluation of the child's developmental maturity compared to other children in his or her age group. The physician should also perform a comprehensive physical examination to rule out any organic causes of ADHD symptoms, such as an overactive thyroid or vision or hearing problems. If no organic problem can be found, a psychologist , psychiatrist , neurologist, neuropsychologist, or learning specialist is typically consulted to perform a comprehensive ADHD assessment. A complete medical, family, social, psychiatric, and educational history is compiled from existing medical and school records and from interviews with parents and teachers. Interviews may also be conducted with the child, depending on his or her age. Along with these interviews, several clinical questionnaires may also be used, such as the Conners Rating Scales (Teacher's Questionnaire and Parent's Questionnaire), Child Behavior Checklist (CBCL), and the Achenbach Child Behavior Rating Scales. These inventories provide valuable information on the child's behavior in different settings and situations. In addition, the Wender Utah Rating Scale has been adapted for use in diagnosing ADHD in adults. 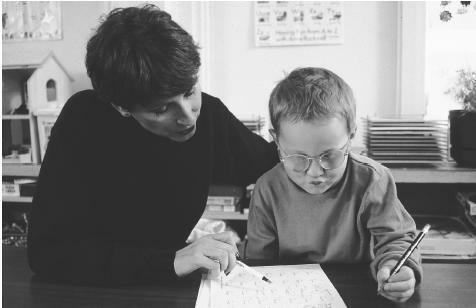 A special education teacher helps a student with attention-deficit/hyperactivity disorder with his math assignment. and anxiety can cause symptoms similar to hyperactivity.) A complete and comprehensive psychological assessment is critical to differentiate ADHD from other possible mood and behavioral disorders. Bipolar disorder , for example, may be misdiagnosed as ADHD. Public schools are required by federal law to offer free ADHD testing upon request. A pediatrician can also provide a referral to a psychologist or pediatric specialist for ADHD assessment. Parents should check with their insurance plans to see if these services are covered. Therapy that addresses both psychological and social issues (called psychosocial therapy), usually combined with medications, is the treatment approach of choice to alleviate ADHD symptoms. Medications known as psychostimulants, such as dextroamphetamine (Dexedrine), pemoline (Cylert), and methylphenidate (Ritalin), are commonly prescribed to control hyperactive and impulsive behavior and increase attention span. These medications work by stimulating the production of certain neurotransmitters in the brain. These medications are usually well-tolerated and safe in most cases, but possible side effects of stimulants include nervous tics, irregular heartbeat, loss of appetite, and insomnia . For children who do not respond well to stimulant therapy, and for children who clearly suffer from depression as well as ADHD, tricyclic antidepressants (a group of drugs used to treat depression) may be recommended. Examples of these antidepressants include desipramine (Norpramin, Pertofane) and amitriptyline (Elavil). Reported side effects of these drugs include persistent dry mouth, sedation, disorientation, and cardiac arrhythmia (an abnormal heart rate), particularly with desipramine. Other medications prescribed for ADHD therapy include buproprion (Wellbutrin), an antidepressant; fluoxetine (Prozac), an SSRI antidepressant (a group of medications used to treat depression by directing the flow of a neurotransmitter called serotonin); and carbamazepine (Tegretol, Atretol), an antiseizure drug. Clonidine (Catapres), a medication used to treat high blood pressure, has also been used to control aggression and hyperactivity in some ADHD children, although it should not be used with Ritalin. Because a child's response to medication will change with age and maturation, ADHD symptoms should be monitored closely and prescriptions adjusted accordingly. Behavior modification therapy uses a reward system to reinforce good behavior and task completion and can be implemented both in the classroom and at home. A tangible reward such as a sticker may be given to the child every time he completes a task or behaves in an acceptable manner. A chart may be used to display the stickers and visually illustrate the child's progress. When a certain number of stickers are collected, the child may trade them in for a bigger reward such as a trip to the zoo or a day at the beach. The reward system stays in place until the good behavior becomes ingrained. A variation of this technique, cognitive-behavioral therapy , may work for some children to decrease impulsive behavior by getting the child to recognize the connection between thoughts and behavior, and to change behavior by changing negative thinking patterns. Individual psychotherapy can help an ADHD child build self-esteem, provide a place to discuss worries and anxieties, and help him or her to gain insight into behavior and feelings. Family therapy may also be beneficial in helping family members develop coping skills and in working through feelings of guilt or anger parents may be experiencing. ADHD children perform better within a familiar, consistent, and structured routine with positive reinforcements for good behavior and real consequences for bad behavior. Family, friends, and caretakers should all be educated on the special needs and behaviors of the ADHD child so that they can act consistently. Communication between parents and teachers is especially critical to ensuring an ADHD child has an appropriate learning environment. EEG (electroencephalograph) biofeedback . By measuring brainwave activity and teaching the ADHD patient which type of brainwave is associated with attention, EEG biofeedback attempts to train patients to generate the desired brainwave activity. Limited sugar intake. However, data indicate that this method does not actually reduce symptoms. Untreated, ADHD negatively affects a child's social and educational performance and can seriously damage his or her sense of self-esteem. ADHD children have impaired relationships with their peers, and may be looked upon as social outcasts. They may be perceived as slow learners or troublemakers in the classroom. Siblings and even parents may develop resentful feelings towards a child with ADHD. Some ADHD children also develop a conduct disorder problem. For those adolescents who have both ADHD and a conduct disorder, up to 25% go on to develop antisocial personality disorder and the criminal behavior, substance abuse, and high rate of suicide attempts that can be symptomatic of that disorder. Children diagnosed with ADHD are also more likely to have a learning disorder, a mood disorder such as depression, or an anxiety disorder. Approximately 70%-80% of ADHD patients treated with stimulant medication experience significant relief from symptoms, at least in the short term. Approximately half of ADHD children seem to "outgrow" the disorder in adolescence or early adulthood; the other half will retain some or all symptoms of ADHD as adults. With early identification and intervention , careful compliance with a treatment program, and a supportive and nurturing home and school environment, children with ADHD can flourish socially and academically. American Psychiatric Association. Diagnostic and Statistical Manual of Mental Disorders. 4th ed., text revised. Washington, DC: American Psychiatric Press, Inc., 2000. Arnold, L. Eugene. Contemporary Diagnosis and Management of Attention Deficit/ Hyperactivity Disorder. Newtown: Handbooks in Health Care Company, 2000. Boyles, Nancy S. Parenting a Child with Attention Deficit/Hyperactivity Disorder. New York: Contemporary Books, 1999. Fowler, Rick, and Jerilyn Fowler. Honey, Are You Listening? Attention Deficit/ Hyperacitivity Disorder and Your Marriage. Gainsville: Fair Havens Publications, 2002. Goldman, Lee, J. Claude Bennett, eds. Cecil Textbook of Medicine. 21st ed. Saint Louis: Harcourt Health Sciences Group, 2000. Jones, Clare B. Sourcebook for Children with Attention Deficit Disorder. San Antonio: Communication Skill Builders/ Therapy Skill Builders, 1998. Morrison, Jaydene. Coping with ADD-ADHD: Attention- Deficit Disorder- Attention Deficit Hyperactivity Disorder. New York: Rosen Publishing Group, 2000. Munden, Alison. ADHD Handbook: A Guide for Parents and Professionals. Philadelphia: Taylor and Francis, Inc., 1999. Noble, John. Textbook of Primary Care Medicine. Saint Louis: Mosby, Incorporated, 2001. Osman, Betty B. Learning Disabilities and ADHD: A Family Guide to Living and Learning Together. New York: John Wiley and Sons, 1997. Tasman, Allan, Jerald Kay, MD, Jeffrey A. Lieberman, MD,eds. Psychiatry. 1st ed. W. B. Saunders Company, 1997. American Academy of Child and Adolescent Psychiatry. (AACAP). 3615 Wisconsin Ave. NW, Washington, DC 20016. (202) 966-7300. <http://www.aacap.org> . Attention Deficit Disorder Association (ADDA). 1788 Second Street, Suite 200, Highland Park, IL 60035. Telephone: (847) 432-ADDA. <http://www.add.org> . Children and Adults with Attention Deficit Disorder (CH.A.D.D.). 8181 Professional Place, Suite 201, Landover, MD 20785. CHADD National Call Center (800) 233-4050. Web site: <http://chadd.org> .